Defenders: Trent Alexander-Arnold (Liverpool), Gary Cahill (Chelsea), Kyle Walker, John Stones (Manchester City), Harry Maguire (Leicester), Kieran Trippier, Danny Rose (Tottenham Hotspur), Phil Jones, Ashley Young (Manchester United). I’m not surprised with Hart doesn’t deserve to be there. I think that regarding Hart and Wilshere it has been the case of the 'Emporers new clothes'. Their ability and form was not keeping pace with their reputations. I don't think that Joe hart should go to the World Cup after some of his performances this season. However in a sense of fairness. Stoke let in 68 goals this season and were relegated so Butland hasn't exactly had a fantastic season and as for Pickford. His display against us for Everton in our final game was one of the worst performances by a goalkeeper I have ever seen. If the England team is being picked fairly I wouldn't take Butland , Pickford or Hart!!!!!! Stoke let in 68 goals this season and were relegated so Butland hasn't exactly had a fantastic season and as for Pickford. His display against us for Everton in our final game was one of the worst performances by a goalkeeper I have ever seen. If the England team is being picked fairly I wouldn't take Butland , Pickford or Hart!!!!!! Presumably Southgate is basing it on more than 1 game in the season. 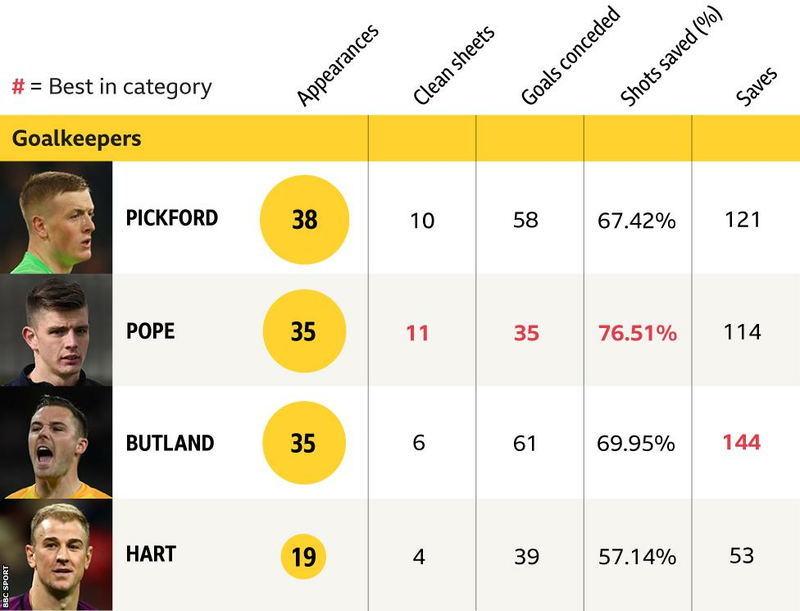 Butland has made more saves than Hart, Pickford or Pope and also has the 2nd best saves per shot % . Also hart played only 19 games half of Pickford. I would like the stats based on time on the pitch. Or you could just multiply the 'appearances' by 90m for a 'near-enough' comparison. And, all club bias aside, would have taken Carroll over Welbeck all day long. Think the 10 defenders 5 midfielders definitely means we are playing 3 at the back with wingbacks. Besides the PL he had another 10 appearances in the Europa League. So 3 at the back with WB will be the formation. Delph and Young can play in a couple of positions. TBH I would only question a couple of the choices but about the best he could pick I think. Pickford should have been dropped after his display against us alone. for example- Arnie's goal went straight through him and our third goal he flapped at it so weekly it was embarrassing for him. Also who is to say how easy the saves were that each keeper made and also it is going to be obvious that Butland made more saves than most (but he let in more than most as well) . He played for a relegated team. It is not the number of saves you make it is the difficulty and importance of them that makes you a good keeper. Doesn't matter who is between the sticks really there will always be an England Gaffe at a major tournament when it comes to the keeper. Doesn't matter who is between the sticks there really as there will always be an England Gaffe at a major tournament when it comes to the keeper. Phil Jones? Played 3 games since January. Danny Rose is likely to end up at Man Utd next season. Welbeck, though. In what situation is he going to play? He's 4th choice striker. He's only going to play from the bench. Why not have a player that can actually make an impact. A Plan B. A human siege tower. Carroll may not be the most graceful footballer, but I'd have him in every competitive England squad. AC gets slaughtered for never being fit now you want him to play an out of season tournament as well. Referees take him to task over here so in the World Cup he wouldn't stand a chance. From an England point of view, yes, I'd want him to go. If you're going to have a 4th choice striker I'd rather it be someone who can actually influence a game from the bench. What does Welbeck do that the other three strikers can't? The referees may target him, but I know I'd rather take that risk than looking to Welbeck to go and bully a tiring defence. Arsenal 22, and in 6th place is West Ham. What's everyone starting line up for England's first game versus Tunisia ?